Advanced Records Management provides hard drive and backup media destruction at your location for convenience and security. 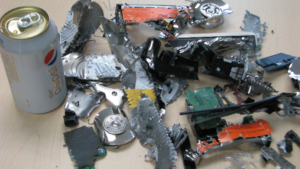 Never trust your sensitive, confidential data to an eWaste recycling event! Erasing, deleting, degaussing…none of these are enough to truly protect your data. For total information security and peace of mind, you need physical destruction. 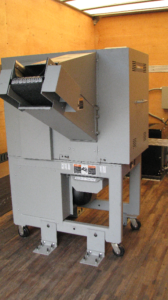 We use a 3-phase 8-inch hard drive shredder capable of shredding up to 500 hard drives per hour and can also shred backup media such as tapes/CDs/DVDs and Blu-Rays. 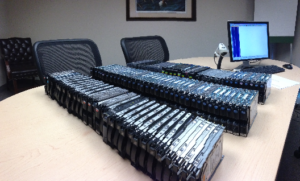 We scan and record the serial number of each drive/backup media. We shred each item on-site at your location, while you watch. You receive a Certificate of Destruction listing the serial numbers of each item shredded. We take the pieces to a trusted, local recycler to be made into new, earth-friendly products. Let us help you keep your confidential information out of the wrong hands. For more information or to schedule your on-site shredding service, please call us or complete the form on this page.